Way to Go, Billy ! Congratulations to Billy Joel for understanding how the National Anthem ought to be sung and having the class and the personal security to do it the right way. The 57-year-old Joel sang The Star Spangled Banner at the Super Bowl last for the second time in his career; his initial performance was in 1989. 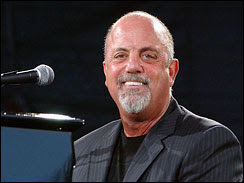 Billy Joel spared the nation another horrendous performance laced with ego and verbal pyrotechnics, as the people given this honor in past Super Bowls invariably try to out-do every other person ever selected to sing at any major sports event and sang the song the way it is actually written, the way it was intended. "You know, honestly, I approach it as a musician," Billy said. "It's a difficult song to sing in the first place. There's a 15-note — an octave and a half span in the song.” "So," he concluded, "I think you stick to the script. Don't take it out 50 ways from Sunday. You have to treat it with respect,” he said. Congratulations to Billy Joel for having the good sense to understand his role, to recognize that the Super Bowl isn’t about the person singing the National Anthem, and for singing it properly. Let's hope he has started a trend.